After a decision to change careers and enter the wine world the Meyers spent three years searching for the perfect vineyard site in the Okanagan Valley. In 2006 they purchased a small 1.62 hectare vineyard on the Naramata Bench, and in 2008 purchased another 6.9 hectares in Okanagan Falls. Working with the best winemaker and viticulturists they focus on crafting small lot single vineyard wines. The McLean Creek Road Vineyard is located in Okanagan Falls. The vineyard has a predominantly steep southerly aspect with the soil comprised of alluvial and glacial deposits making up a mix of gravelly and sandy loams. The vines are managed organically. At the winery, the fruit is gently de-stemmed before undergoing a cold soak in open top fermenters. A mix of indigenous and cultured yeast carrries out a long fermentation at 30C with gentle hand plunging. The free run wine is transferred to French oak barrels (about 30% new) where it stays for 11 months. The press wine is kept separate. In the spring the wine undergoes a natural malo-lactic fermentation. 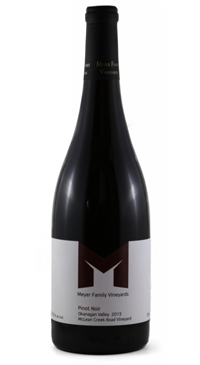 This is a complex Pinot Noir with aromas of ripe dark cherries, autumn leaves and subtle smoke and oak notes. Those aromas carry onto the broad and silky smooth palate that is enlivened by lively acidity. A long pleasing finish.